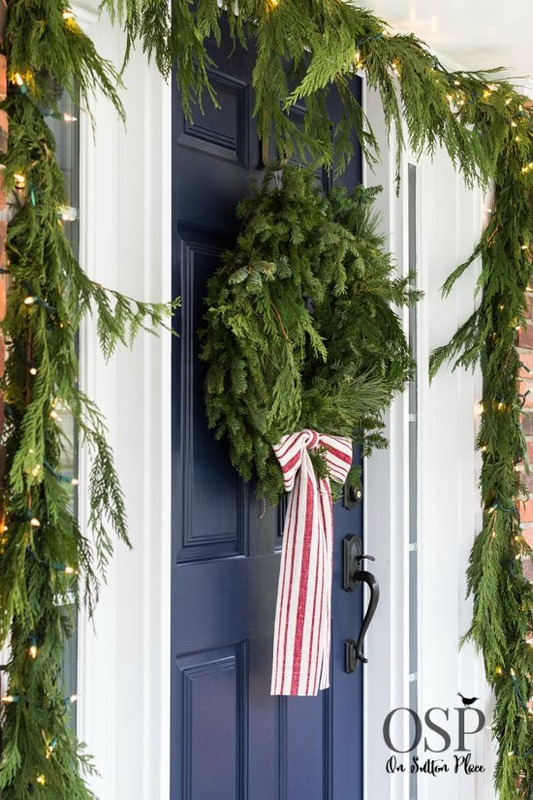 First of all, thank you to everyone for your kind comments about my Christmas Home Tour. Each one warmed my heart and made me smile so I thank you for that too. 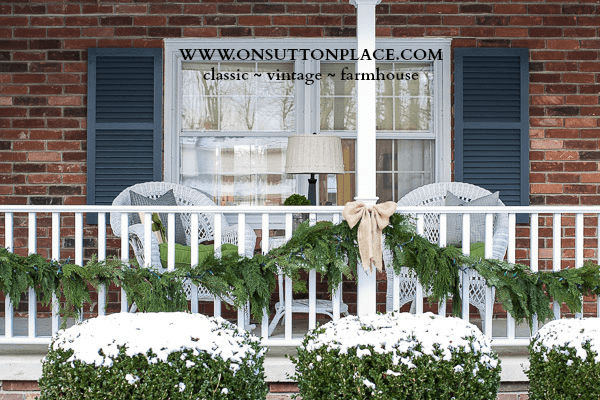 I wanted to share a few details about my Christmas Porch Decor because I honestly believe that with a little effort and patience any boring space can be transformed. It usually doesn’t happen overnight but it doesn’t have to cost a lot. My front porch is proof of that. This porch does not have much going for it. Cement floor, basic white railing, not very big. I was determined to give the best first impression I could though so I’ve always decorated it like an indoor space. Chairs, pillows, tables, plants and even occasionally a lamp. For this year’s Christmas decor I kept it simple but the pops of red make it show up even from the street. I got the throws last year on eBay and the pillow covers are from IKEA several years ago. They have lasted forever because I only use them for one month out of the year! The trio of Christmas trees was a deal of the day from Decor Steals. I adore them. They are actually weighted under that burlap so I don’t think they will topple over. So far so good. I never in a million years thought I would be saying this but I wish it would snow. Just a little. Here is a picture of my Christmas porch from last year. It just looks more Christmasey with the snow. As you can see though the boxwood pictured below are gone…a casualty of that snow from last year. Maybe I should rethink my wish! 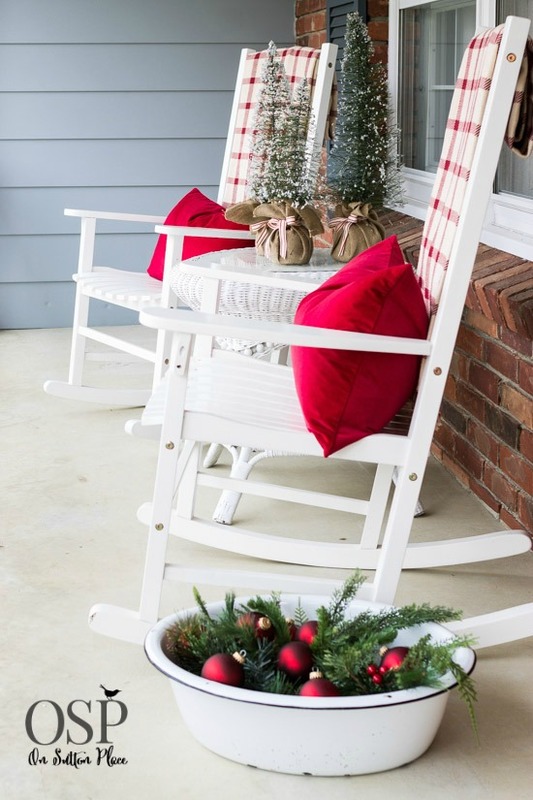 Very pretty…I love all the greenery and your rocking chairs! Ann – I love your red & white checked throws on the backs of the rockers! Would you please share where I might find them? Love, love, love your decorating style! I like the cedar garland on the railing from last year also. It softens the stark white railing a lot. Classy !! Would you share where the red/white stripe ribbon that is on the trees is from? Very pretty, Ann. 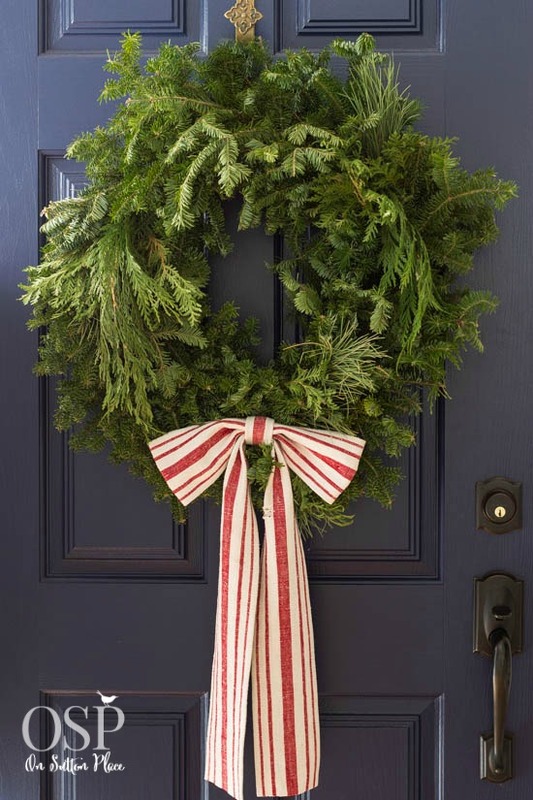 The doorway looks beautiful with your greenery and the ribbon and grain sack red looks so updated yet festive! It looks like you switched from wicker to rocking chairs…I love it! Beautiful porch Ann. Very welcoming. Ann,thank you for sharing your pillow yesterday & where you got it. I ordered 3,I for myself & others for gifts.Thanks again for all your posts.Merry Christmas. What a welcoming entry to your home. It is attractive and inviting. I’m thinking about using the wash tub idea for an area around our home. Thanks for the idea! 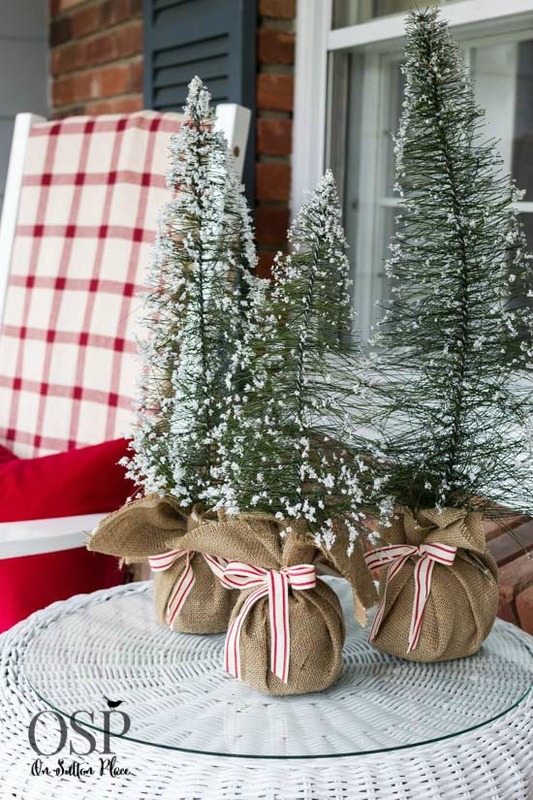 Love the red and white theme…..the planters are very much in style and I think you had a great idea…keep up the beautiful good work….look forward to your wrapping ideas…. 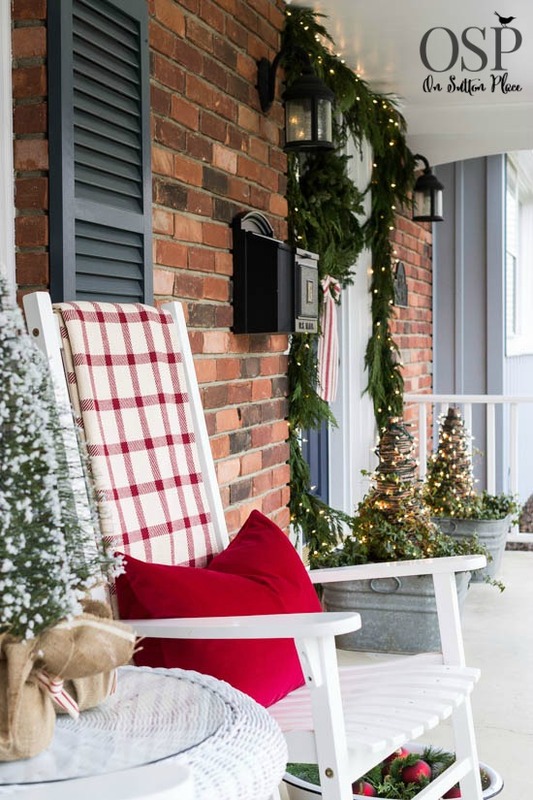 I have a special fondness for front porches, and yours is always one of my favorites. We love ours, too, and I try to make a few minutes to sit and take in the world from there every day. Sometimes it is very few minutes because it is just too cold. Love the trio of trees. How did I let that notice slip by me??? I need to pay more attention. Ann, your house and your porch are so beautiful and inviting. Thank you for opening your home and sharing ideas with your readers. I made your Berry-Orange muffins this morning…oh my, simply delicious! Merry Christmas! The 1st thing I did after reading this charming post, was to put cream and green fabric bows on my tree’s from Decor Steals and a few others. It really gave them a finished look. 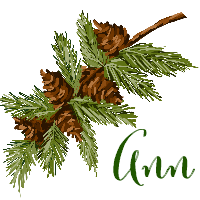 I put larger green and cream bows on baskets that were filled with pinecones I had sprayed silver. 2 went on some tall buffet lamps. I keeping looking around for other places, that might be available. 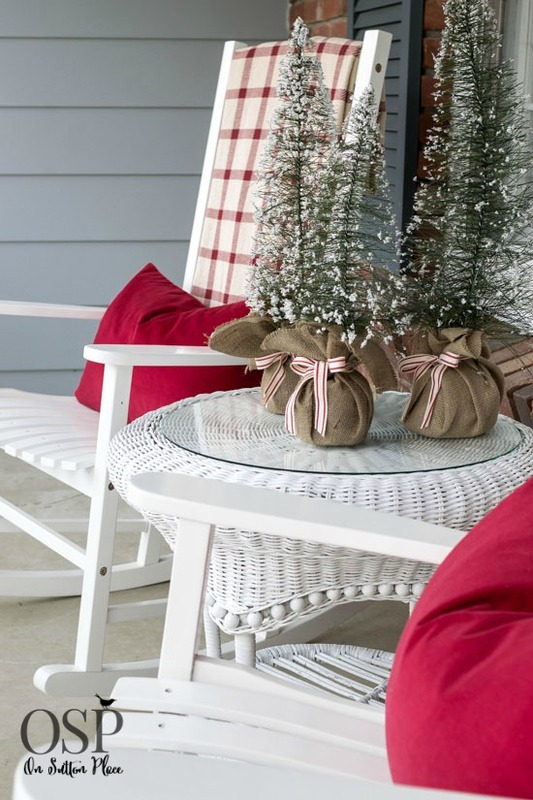 Love your front porch with the red, it looks so inviting. I also loved the one with your mini schnauzer. I have one just like it! Mine is a little girl named Zoe and is the love of our lives. What is your dog? I look forward to your post everyday and get lots of ideas. The porch is beautiful,thanks and Merry Christmas. 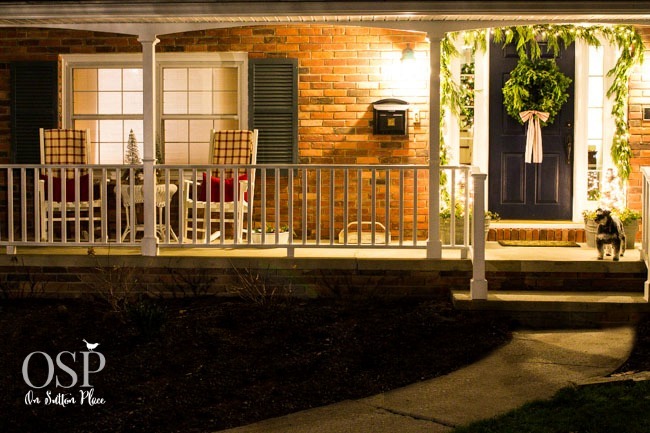 Your porch is glowing and amazing! Must be the prettiest on the block. From a long time friend you really found your calling. You have a true decorating eye. You put your classy edge to things but keep it simple. The front porch is beautiful! I love the throws and red pillows. Very you!! I love every picture you post! It is classic and festive and beautiful!! Ann, your porch is absolutely beautiful!! 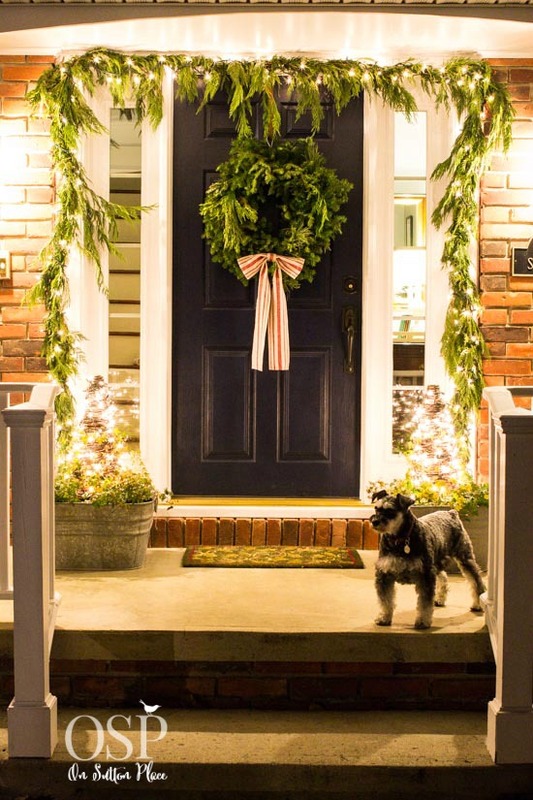 It is so inviting with perfect Christmas charm. Love the pops of red! You amaze me with your welcoming creativity. I love it. I hope the joy you bring to others will return to you over and over! Beautiful, simple, peaceful decorating. Thanks for the inspiration as always! Ann, the front porch is just lovely. You have brought in well chosen items to create a very welcoming first impression. I love it. The red just pops and says “Christmas.” Well done. I enjoyed reading your post. Now, I would love to find those throws! Hi, I love your ideas. My porch is set high and tough to see from the road. Can you give me an idea on how to show off my 50 year old Flexible Flyer sled? I really want to use it this year. Any hints! Thanks so much. I love everything you do!!! My problem is our dogs. We live on a farm and have outdoor dogs who would demolish anything I would put on my wicker rockers!!! So I just have to dream I live on Sutton Place and decorate the walls of my porch. Merry Christmas and Happy New Year!!! GORGEOUS! I would love to have a porch some day! Yours is beautiful! Hello! I’ve just discovered your blog through the Holiday House Walk. Your home is so beautiful! Out of all the beautiful blogs I have visited, yours seems to be my favorite. I just love your style! I love how it’s fresh and modern with just a little bit of classic thrown in! I’m looking forward to keeping up with you everyday. You’ve really inspired me to decorate. Merry Christmas!